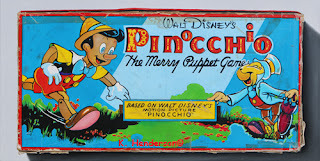 The Adventures of Pinocchio written by Carlo Collodi 1883 is one of the creepiest children's stories I've ever read. I love it! 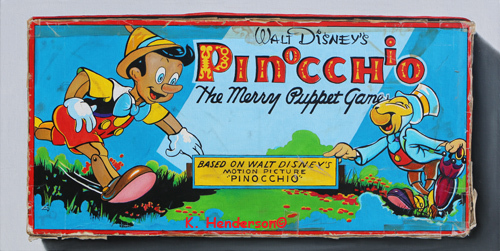 In 1939 Milton Bradley created this board game based on Disney's motion picture.The box top depicts images of Pinocchio and his protector Jiminy Cricket. 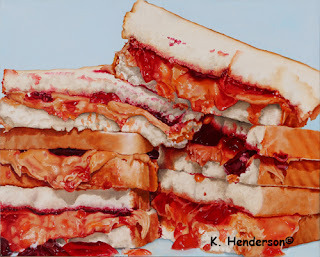 I love peanut butter sandwiches. I eat them plain or with any kind of jam of jelly! I have a few boxes of Rubens Crayola and this one is the oldest. 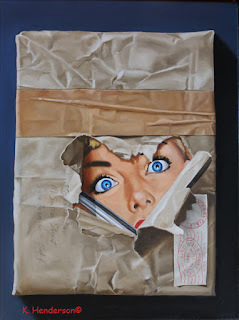 Although I don't know the exact date of this box, the Rubens No. 18 (my box only has 17 crayolas) first came out in 1905. 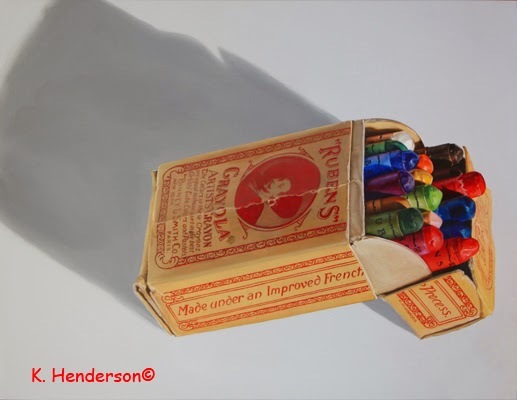 The Rubens Crayola line, started in 1903 was directly targeted at artists and designed to compete with the Raphael brand of crayons from Europe. I love the picture of Peter Paul Rubens and the filigree. 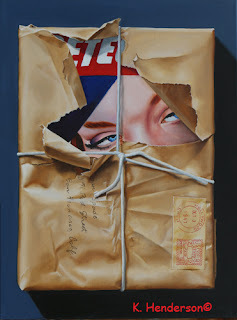 The paper wrap on each crayon also has the word 'Rubens' and the face of Ruben although he is facing towards the right instead of the left as on the box. These vintage crayons are over 100 years old and in great shape. This painting composition created itself. 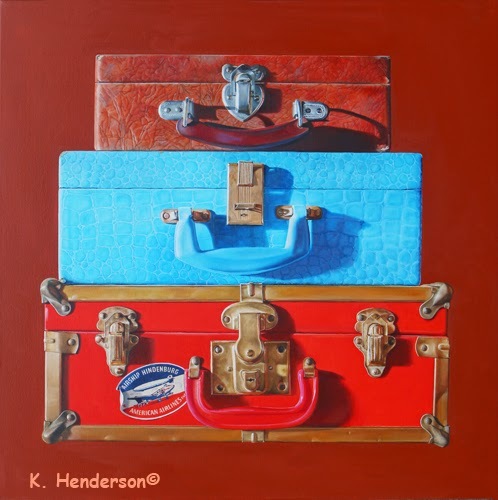 I have been wanting to use some of my vintage suitcases in a painting for quite some time but couldn't get excited about any of the ideas I was coming up with. I had these three cases stacked on a table and one morning I just happen to glance at them while the sun was coming up and shining through the window. The sun created the perfect light and dark contrast, the background looked to be a dark sienna. I grabbed my camera and quickly took several reference photos. 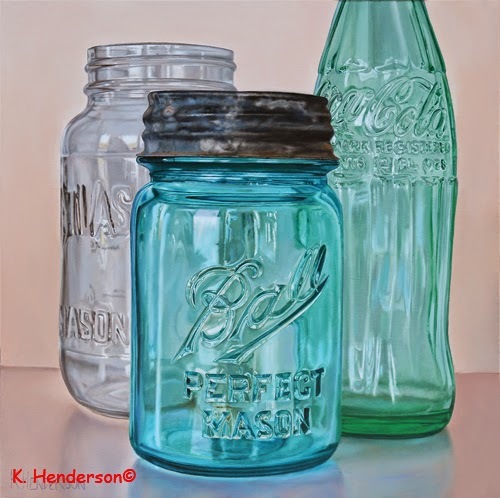 I've painted several small Coca Cola paintings this year and decided to create a larger Coke painting. My vintage Coke Bottle is joined by an Atlas Mason and a Ball Perfect Mason jar. Yikes! This painting was a lot more time consuming than I thought it would be. 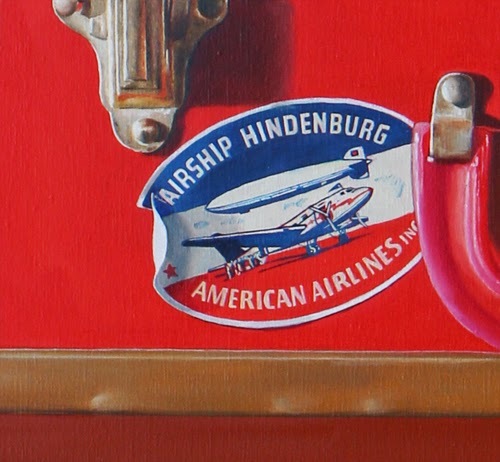 The raised letters on each of the bottles required shadows and highlights on each of them. The patina on the Zinc lid added a contrast to the colorful shiny glass. 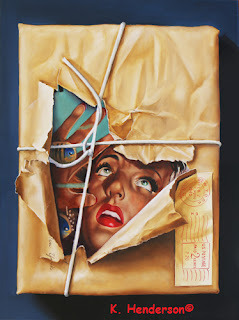 This is from my series "Toys in a Box" . 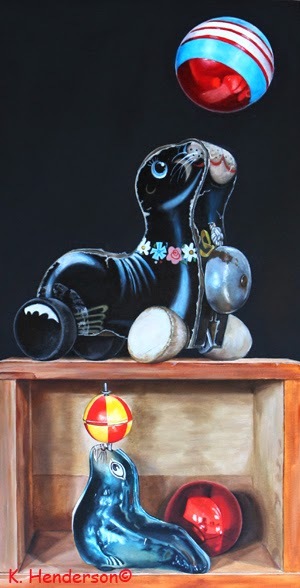 I was interested in this composition because of the contrasts in the painting: the light and the dark, the shiny metallic seal and the flat surface of the wooden seal. One seal in confined in the box and the other is free with the floating ball. 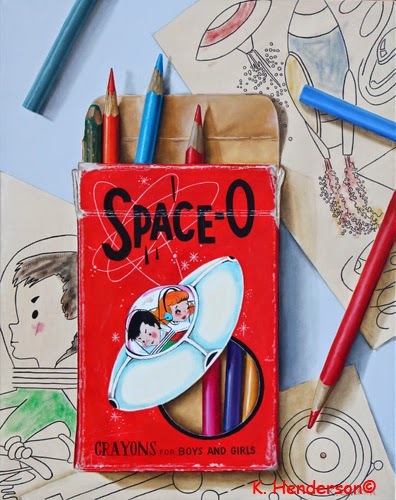 This vintage box of colored pencils makes me smile. 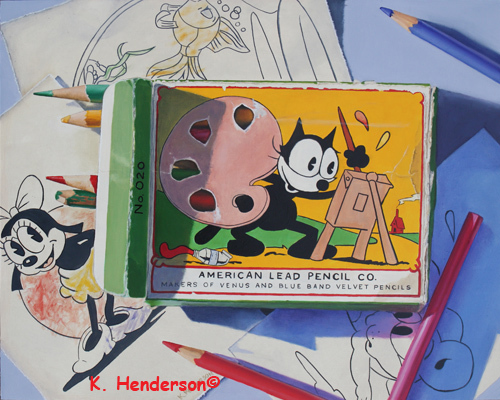 It shows Felix the Wonderful Cat feverishly painting En Plein Air. The Case of the Sulky Girl is Erle Stanley Gardner's second Perry Mason novel. It was written in 1933.